Are you looking for the perfect place to get your hands on the Toshiba e-Studio 556 copier? Well, look no further because Arizona Copiers has the widest selection of Toshiba models and their related supplies in the industry. With more than two decades of experience providing businesses with all of their copier needs, our trained professional staff will be able to find you the best solution available. Our customer satisfaction guarantee also ensures that your business will receive top-notch customer service and quick, secure delivery of your copier in perfect condition. We welcome you to give us a call today at 602-428-5885 to learn more about our superior services. The key to business success is the possession of a high-quality multifunction copier that will keep up with your workload and maintain a seamless workflow for optimal productivity. Luckily, the Toshiba e-Studio 556 is specifically engineered for this purpose. It boasts tremendously fast printing at 55 pages per minute, along with high-speed color scanning of 77 originals per minute! Even with that high-speed chase of printing, there is no compromise to the quality of the end result whatsoever. The laser electronic copier prints at an incredible 2400×600 for exceptionally crisp output every single time. When you purchase, lease, or sell this Toshiba model from the Arizona Copier company, your business will receive new added heights of security for all of your sensitive information. Toshiba understands the importance of privacy, so they have outfitted this Toshiba e-Studio 556 with special SecureMFP technology that protects data, print output, scans, and PDF files automatically. There is no more need to be concerned about sensitive data being leaked, since this model is equipped with controlled access and authentication systems for the best possible guard against data theft. It may seem like all of these high-tech features will make the system complex and difficult to use; however, the opposite is actually true. This Toshiba model includes improved ease of use with its 9-inch color display touch screen that functions in a similar way to smart phones, which means all members of the workforce will operate the unit with minimal training. The user-friendly copier also includes easily replaceable toner cartridges that can be quickly changed on the fly. Thus, your business can minimize wasted time spent fiddling with the machine, and more time increasing your output for success. Out of all of the brands that we offer to our customers, the innovative Toshiba models seem to be one of the customer favorites. Not only is the copier extremely high-quality, it also is constructed utilizing eco-friendly components that will reduce your business’ carbon footprint. The Energy-Star rated Toshiba e-Studio 556 will help reduce environmental waste, lower energy use, and decrease the total on your monthly electricity bill to save you capital. 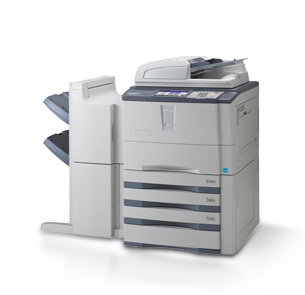 Furthermore, Arizona Copier will also be able to find you the most affordable unit on the market today. Please contact us at your earliest convenience at 602-428-5885 to get started!